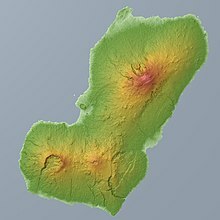 Bioko (also spelled Bioco, in Europe traditionally called Fernando Po [fɨɾˈnɐ̃du ˈpɔ] from the period of Portuguese colonization) is an island 32 km (20 mi) off the west coast of Africa, and the northernmost part of Equatorial Guinea. Its population was 334,463 at the 2015 census (preliminary results) and it covers an area of 2,017 km2 (779 sq mi). 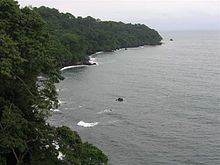 The island is located off Cameroon, in the Bight of Bonny portion of the Gulf of Guinea. Its geology is volcanic; its highest peak is Pico Basile at 3,012 m (9,882 ft). Bioko has a total area of 2,017 km2 (779 sq mi). It is 70 km (43 mi) long from NNE to SSW and about 32 km (20 mi) across. It is volcanic and very mountainous with the highest peak Pico Basile (3,012 m (9,882 ft)). It thus resembles neighbouring islands São Tomé and Príncipe. Like them, it lies on the Cameroon line. 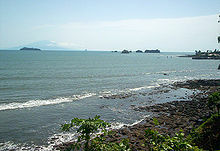 Its southernmost point is called Punta Santiago. Bioko used to be the end of a peninsula attached to the mainland in what is now Cameroon, but it was cut off when sea levels rose 10,000 years ago at the end of the last ice age. The island has a population of 334,463 inhabitants (2015 Census). Its historic indigenous people are the Bubi people who currently constitute 58% of the population. Other ethnicities include the Fang at 16%, Fernandinos at 12%, and the Igbo at 7%, as well as African and European immigrants. The island was inhabited in the middle of the first millennium BC by Bantu tribes from the mainland, who formed the Bubi ethnic group. 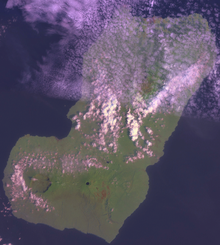 Unlike other islands in the area, Bioko had an indigenous African population. The Bubi speak a Bantu language. The island has probably been inhabited by this or other Bantu-speaking groups since before the 7th century BC. In 1472, the Portuguese navigator Fernão do Pó was the first European to "visit" the island. He named it Formosa Flora ('Beautiful Flower'). In 1494 it was renamed Fernando Pó in his honor after being claimed as a colony by the Portuguese. The Portuguese developed the island for sugarcane crops, and while considered poor quality, the refineries' output was such that Fernando Po sugar briefly dominated the trade centres in Europe. In 1642, the Dutch East India Company established trade bases on the island without Portuguese consent. It temporarily centralized from there its slave trade in the Gulf of Guinea. The Portuguese appeared again on the island in 1648, replacing the Dutch Company with one of their own, also dedicated to slave trading and established in its neighbour island Corisco. Parallel with this establishment, the Bubi clans began the slow process of establishing the core of a new kingdom on the island, especially after the activity of some local chiefs such as Molambo (approx. 1700–1760). During a period when enslavement was increasing in the region, local clans abandoned their coastal settlements and settled in the safer hinterland. Under the 1778 Treaty of El Pardo, Portugal ceded Fernando Po, Annobón, and the Guinea coast, Rio Muni, to Spain, together forming modern Equatorial Guinea. The treaty was signed by Queen Mary I of Portugal and King Charles III of Spain, in exchange for territory on the American continent. Spain mounted an expion to Fernando Po, led by the Conde de Argelejos, who stayed for four months. In October 1778, Spain installed a governor on the island who stayed until 1780, when the Spanish mission left the island. Chief Molambo was succeeded by another local leader, Lorite (1760–1810), who was succeeded by Lopoa (1810–1842). After abolishing the British Atlantic slave trade, from 1827 to 1843 the British leased bases at Port Clarence (modern Malabo) and San Carlos for anti-slavery patrols. The settlement at Port Clarence (named after the Duke of Clarence) was constructed under the supervision of William Fitzwilliam Owen. He had previously mapped most of the coasts of Africa and was a zealous anti-slaver. During his three-year command, his forces detained 20 ships and liberated 2,500 slaves. The Court of Mixed Commission was moved from Freetown, Sierra Leone, to Clarence to hasten the legal process of emancipating slaves liberated from slave ships. In 1923–1930, the League of Nations investigated the transportation of contract migrant labour between Liberia and the Spanish colony of Fernando Po. Although the League concentrated its attention on arrangements in Liberia, a closer examination revealed that labour abuse arose from conditions on Fernando Po. In the last quarter of the 19th century, Krio planters on the island had shifted from palm oil trading to cocoa cultivation. Their dependence on migrant labour and increasing competition with Europeans resulted in an economic crisis in the first years of the twentieth century. Planters detained labour but failed to pay their contracts, resulting in a situation of de facto slavery. Liberia prohibited labor traders from contracting with their citizens. During the Nigerian civil war in the 20th century, relief agencies used the island as a base for flights into Biafra. Given the numerous ethnic groups and peoples who operated on Bioko, a creole language developed, known as Pichi. It is based on English grammar, from the period when the British operated bases for their forces. It also incorporates West African languages from Nigeria and Liberia, as well as the Krio language that had developed in Sierra Leone. Workers came from all these areas in the 19th through much of the 20th century. Spanish has been an official language since 1844 when Spain took control of the island. It is still the language of education and administration, related to the more than 100 years as a Spanish colony. 67.6% of Equatorial Guineans can speak Spanish, especially those living in the capital, Malabo, on Bioko. Malabo is the capital city of Equatorial Guinea. The island is mostly covered by tropical rainforest. Located on Punta Europa, west of Malabo, the Alba Gas Plant processes natural gas delivered from offshore production wells. The plant is operated by Marathon Oil Company through its subsidiary, Marathon Equatorial Guinea Production Limited (MEGPL). The plant produces natural gas liquids (NGL) including propane, butane, and condensate products. The majority of the residue gas from the Alba plant is delivered to a natural gas liquefaction plant operated by EG LNG. A portion of the Alba plant residue is also delivered to the Atlantic Methanol Production Company (AMPCO) and is used to produce methanol. The products from all three plants are loaded onto ocean-going tanker ships for export. A rectangular transport route links the four main cities: Malabo, Luba, Baney, and Riaba. The airport is Malabo International Airport. Fernando Pó is mentioned throughout The Illuminatus! Trilogy, by Robert Shea and Robert Anton Wilson (under the spelling "Fernando Poo"), as the site of Cold War tensions involving the United States, Soviet Union, and People's Republic of China. The 2012 Spanish romantic novel Palmeras en la nieve and its 2015 film adaptation, Palm Trees in the Snow, are mainly set in Fernando Pó. Operation Postmaster a British SOE operation in the island during World War II is described in detail in the book "Churchill's Ministry of Ungentlemanly Warfare" by Giles Milton. Fernando Po is commemorated in the scientific name of a species of lizard, Lepidothyris fernandi, which is found on the island. Emancipados, black people in Spanish Guinea assimilated to the Spaniards. Fernão do Pó, commander of the first European ship to land here. Tetteh Quarshie, a Ghanaian who introduced cocoa to his native country from the island. ^ Minahan, James (2002). Encyclopedia of the Stateless Nations: A-C. Greenwood Publishing Group. p. 330. ISBN 0313321094. ^ Census 2015, DGECN, Equatorial Guinea. ^ McNeil Jr, Donald G. (16 September 2010). "Precursor to H.I.V. Was in Monkeys for Millenniums, Study Says". The New York Times. ^ "Bioko". Encyclopædia Britannica. Retrieved 28 April 2015. ^ Pospelov, E. M. (1998). Geograficheskie nazvanii︠a︡ mira: toponimicheskiĭ slovarʹ. Moskva: Russkie slovari. ISBN 978-5-89216-029-2. ^ "British Empire: Africa: Fernando Po". britishempire.co.uk. Retrieved 28 April 2015. ^ Beolens, Bo; Watkins, Michael; Grayson, Michael (2011). The Eponym Dictionary of Reptiles. Baltimore: Johns Hopkins University Press. xiii + 296 pp. ISBN 978-1-4214-0135-5. ("Fernand", p. 89). Janikowski, Leopold (1886). L'ile De Fernando-Poo, Son Etat Actuel Et Ses Habitants [The Island of Fernando Po, its current state and its inhabitants] (in French) (Bulletin De La Société De Géographie, Septième Série. - Tome Septième ed.). Janikowski, Leopold (1887). La Isla de Fernando Póo, su estado actual y sus habitantes [The Island of Fernando Po, its current state and its inhabitants] (in Spanish) (Boletín dela sociedad Geográfica de Madrid XXII ed.). pp. 67–77 and 201–211. Janikowski, Leopold (1936). W dżunglach Afryki. Wspomnienia z polskiej wyprawy afrykańskiej w latach 1882-90 [In the African Jungle. Memories of the Polish expion to Africa in the years 1882-1890] (in Polish) (1936 ed.). Warsaw, Poland: Wydawnictwo Ligi Morskiej I Kolonjalnej; Skład Główny: Instytut Wydawn. Bibljoteka Polska S. A. Archived from the original on April 9, 2015. Retrieved April 9, 2015. Wikimedia Commons has media related to Bioko. Wikivoyage has a travel guide for Bioko.